Paul Fahy, artistic director Galway International Arts Festival (GIAF); actor Cathy Belton; mayor of Galway Cllr Frank Fahy and John Crumlish chief executive GIAF at the opening. 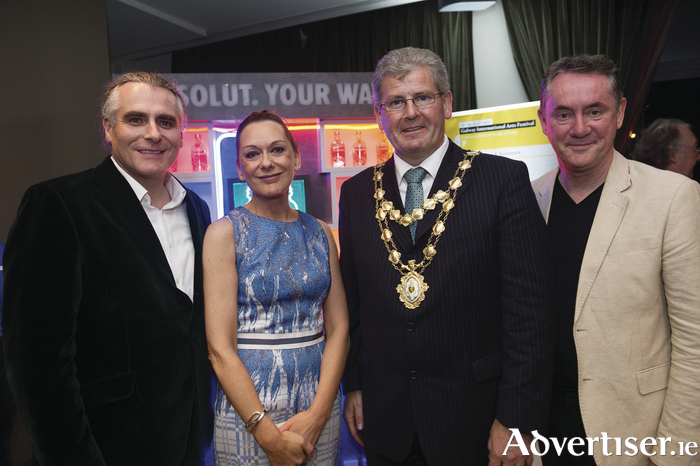 The city’s arts fraternity were out in force and in high good cheer at the Radisson Hotel on Monday night for the launch of the 38th Galway International Arts Festival and the 10th under the stewardship of artistic director Paul Fahy. Among the festival’s featured artists present for the occasion were writer/performer Amy Conroy and her cast, whose play Luck Just Kissed You Hello had just opened at the Mick Lally Theatre. Other visitors enjoying the festivities were Australian artist and Skywhale creator, Patricia Piccinini; Russian artist Varvara Shavrova; and cast members of Exhibit B by Brett Bailey. Mayor Frank Fahy, the first of the guest speakers to address the crowd, noted that some 180,000 visitors would pass through Galway during the two weeks of the festival, generating a significant amount of business. He remarked on how much the Galway City Council values the arts festival, all the more so as it prepares the 2020 European Capital of Culture bid. Mayor Fahy also saluted a number of young American interns who were present and are working as volunteers with the festival. Arts festival CEO John Crumlish began by thanking the festival’s key funders, partners, sponsors, friends, and co-producers. He quoted Victorian designer William Morris who said art, education, and freedom are not just for the few - a motto which also informs the GIAF’s ongoing commitment to making the festival as big and as good as possible. He used the analogy of the advent calendar with treats waiting behind its little doors, and observed that the festival similarly aims to provide treats behind each of its artistic doors and he invited the public to sample them. Brendan McGrath, chief executive of Galway City Council spoke next, focusing on the European Capital of Culture bid. He stated that culture would be at the centre of what the city was about as it girds up for the fateful bid and that 2020 will be part of creating a longer-lasting creative vision for Galway. The bid organisers have already hosted 20 ‘speak outs’ which have attracted more than 1,000 attendees as well as establishing a number of teams to co-ordinate different strands of the bid. He called it a “once in a lifetime” opportunity “to change the game and transform both the city and county”. He expressed the desire to inform all the citizens of the region as to what the Capital of Culture is about - culture in its widest sense embracing such areas as sport, history, heritage and food. Plans are in place to invest a budget of some €30 to 40 million into the enterprise, quite aside from capital projects. His closing comment that “2020 is Galway’s year” was greeted with great applause. The final guest speaker was gifted Galway actress Cathy Belton who stars in the festival production of Frank McGuinness’s The Match Box. She fondly recalled her early days in Galway and the many artists around the city, seeing Royal De Luxe in the Cathedral carpark; and her parents taking holidays during the festival so they could attend as many shows as possible. She revealed that discussions on the festival staging of The Match Box commenced two years ago at a dinner with Paul Fahy in Artisan Restaurant where he presented her with a souvenir matchbox. She therewith produced said matchbox and struck a flame to celebrate the coming to fruition of that initial chat and the latest instalment of the thrill-packed extravangza that is the arts festival.